The Oxford Dictionary of English gives the origin of the name as derived from the Sanskrit word khicca, ‘a dish of rice and sesame’. 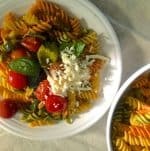 The dish has been known and written about across the ages, with one of the earliest references being ( as a quick browse across Google will tell you) by theGreek ambassador of Seleucus Nicator (ca. 358 BC – 281 BC) who had mentioned that the rice and pulses combination was very popular among South Asians. 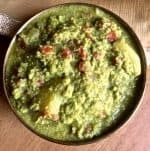 Another much mentioned reference is of Jean-Baptiste Tavernier, a French traveler and merchant, who visited India during the later part of the 17th century (between 1640-1685) and who had described khichidi as being made with green lentils, rice and butter and that it was a popular peasant evening meal. It is said that by the late 19th century this dish became a favourite Anglo Indian breakfast dish Kedgeree, converted from its vegetarian base by adding fish and eggs, and which the British later on introduced in England and Scotland during the time of Queen Victoria. 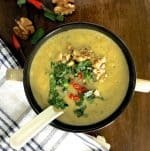 Some interesting historical reference says that the Mughals spiced up the dish, adding strong spices, dry fruits and nuts, and that during the reign of Shahenshah Akbar, the Ain-i-Akbari (forming part of the Akbarnama) gives the recipe for the khichidi prepared in the Royal Kitchens, briefly, as,‘__3. K’hichri. Rice, split dal, and g’hí 5 s. of each; 1/3 s. salt: this gives seven dishes.‘ Im guessing that the ‘s’ here refers perhaps to ‘seer’. 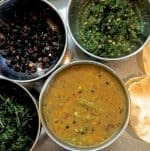 Whether ‘this gives seven dishes’ means 7 varieties of khichidi or 7 pots/ dishes, I don’t know, but the Ain-i-Akbari is certainly very interesting! Do look it up! Not only does this tasty meal come from down the ages, it has many uses. The less spiced thin version, being easy to digest, is a staple for infants as well as for convalescents. Khichidi is part of an Ayurvedic diet and said to balance all three doshas, depending on the spices used. It is a popular component of the diet when fasting or on ‘vrat’ for religious reasons, though the Sabudhana version is more in use at this time. It is generally a lunch or dinner dish often had with a thin kadhi, though the South Indian Pongal, is a breakfast dish. I had never been very fond of Pongal (till I learnt to make it right!) nor was khichidi a favourite, until a few years ago. I was heading an audit team at a famous 5 star + resort property , and we stayed at the hotel for a month and a half. After the first ten days, we found it difficult to eat the actually very tasty food from the hotel kitchens. This was compounded by the fact that all of us were vegetarians and the hotel was famous for its seafood cuisine and for its local cuisine restaurant. 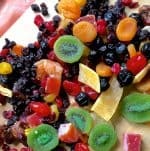 More than 10 days of any cuisine, however tasty, except your own, is usually difficult to take. All we did enjoy, were the desserts! Our friends and family were surprised that we were not wallowing in the 5 star luxury at the famous hotel in an exotic location, but were crying for home food instead. We were finally saved by the khichidi! The Chef (God bless him, and may his Tribe increase!) went out of his way to organize masala khichidi for dinner whenever we asked for it, just for the 3 of us. You can imagine the relief on our faces when after a long tiring day of work, poring over the accounts, we finally headed to the coffee shop where the steaming hot platter of khichidi with the aroma of ghee, accompanied by papad and sometimes chutney, would be waiting for us! Let me introduce you to my khichidi. The most important factor in this preparation is the water used to cook the khichidi. As my daughter Mridula never tires of telling me, you can never have too much water in the khichidi, and remember that less is more here, make smaller quantities and the khichidi comes out really well. 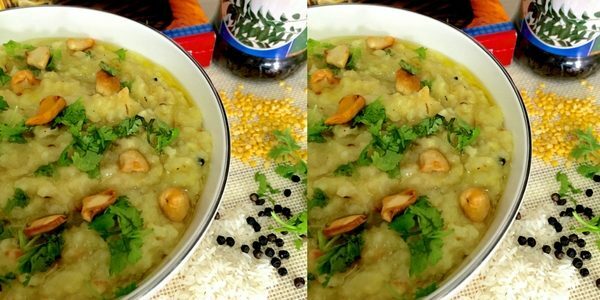 Nutritious Khichidi, the popular Indian dish of rice and split green gram lentils, seasoned and spiced according to the local culinary practices and then cooked into a soft fluid mash and finally garnished with cashew fried in ghee. Clean and wash the rice and dhal. Soak together in water just enough to cover them, and set aside till required. Drain before use. Mince onions, ginger, curry leaves and basil leaves and set aside. Dice the tomatoes. Cut the green chilli into small pieces. Mince the cinnamon piece, crush the cardamom. Heat a pan and add the oil (I fry everything right in the cooker itself and then add the rice and dhal). Add mustard and let it sputter, add jeera (cumin seeds), sauté for 10 secs. Add the clove, cinnamon, cardamom and bay leaf. Sauté for 10 seconds. Add and scald the green chilli pieces (scalding is to let them discolour without becoming black or getting charred). Add the curry leaves (they will crackle and sputter, if fresh) and then the onions. Sauté onions till they are translucent, about 1 minute. Meanwhile, drain the rice and dhal mixture. Add ginger, sauté for 20 seconds. Add the tomato and then the turmeric. Sauté for just 20 seconds. Set the pressure cooker on the stove, warm it and transfer the fried items into it. Add the drained rice and dhal, stir the mixture. Add salt, pepper and basil leaves. Pour 4 to 5 times the volume of water as the total volume of rice and dhal. This is your secret ingredient! Cover the cooker and let it cook for 3 whistles. Don't open the cooker till its ready to be opened, as the cooking process will continue. Meanwhile, break the cashew into pieces, and fry in ghee for a few seconds till the colour begins to darken. Drain and remove quickly from the pan before the cashew begins to burn and set aside. Keep the ghee you used for frying the cashew, ready for use. Once the cooker is opened, stir the khichdi briskly, transfer to a serving dish and pour the hot ghee over it. Add the fried cashew and garnish with the cilantro leaves. Serve piping hot with roasted pappad. Thanks Sundari Giri! It was fun reading up on the origins and going through ancient references!